This app provides a simple AR experience demonstrating the environment texturing features in ARKit 2 and SceneKit. After you build and run the app, explore your surroundings in the camera view. Then, tap a nearby horizontal surface to place a virtual object: a mirror-finish sphere. After you place the object, you can drag it around or tap to move it to another location. You can also pinch to make the object bigger or smaller. Notice the surface of the virtual sphere shows a generally realistic (if not perfectly accurate) reflection of its real-world surroundings. 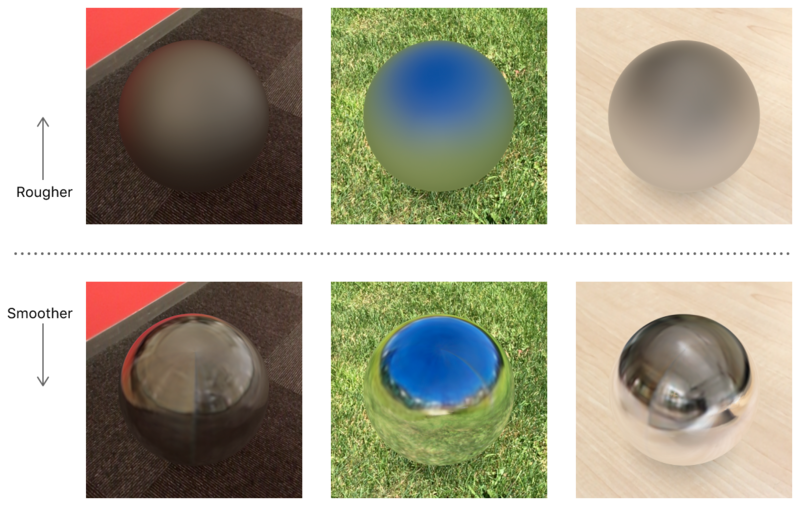 To create reflective virtual surfaces, a renderer (such as SceneKit) needs an environment texture—an image that captures the view in all directions from a certain point in the scene (called an environment probe). Realistically rendering reflections for multiple objects, or moving objects, may require multiple environment textures, each capturing the scene from a different point of view. ARKit generates environment textures by collecting camera imagery during the AR session. Because ARKit cannot see the scene in all directions, it uses machine learning to extrapolate a realistic environment from available imagery. An iOS device with an A9 processor or later. With ARWorldTrackingConfiguration.EnvironmentTexturing.automatic environment texturing (the default for this app) ARKit automatically chooses when and where to generate textures. Because this app also uses ARSCNView to display AR content, SceneKit automatically uses the appropriate environment texture to render each virtual object in the scene. In SceneKit, any asset using physicallyBased materials automatically uses environmental lighting. With environmental lighting, the shading for each point on a surface depends on nearby light probe textures or the global lighting environment in the direction that point faces. The visual effect of environment texturing depends on how you configure the properties of a physically based material. (Typically, ) For example, materials with a high roughness pick up some diffuse color from the texture, and materials with low roughness and high metalness reflect their surroundings with a mirror-like finish. If your AR experience uses a rendering technology other than SceneKit, you’ll need to retrieve the generated textures yourself and determine how to use them appropriately in your shading engine. First, implement the session(_:didUpdate:) delegate method to be notified when ARKit generates environment probe textures. In that method, use the environmentTexture property of each AREnvironmentProbeAnchor object to get the texture. Automatic environment texturing is all you need for basic environmental lighting or reflection effects. To render reflections more realistically, however, each reflective object needs an environment probe texture that accurately captures the area close to that object. For example, in the images above, the virtual sphere reflects the real cup when the cup is close to the sphere’s real-world position. // Make sure the probe encompasses the object and provides some surrounding area to appear in reflections. extent.x *= 3 // Reflect an area 3x the width of the object. extent.z *= 3 // Reflect an area 3x the depth of the object. // bottom of the object so that it captures the real-world surface underneath. // Create the new environment probe anchor and add it to the session. 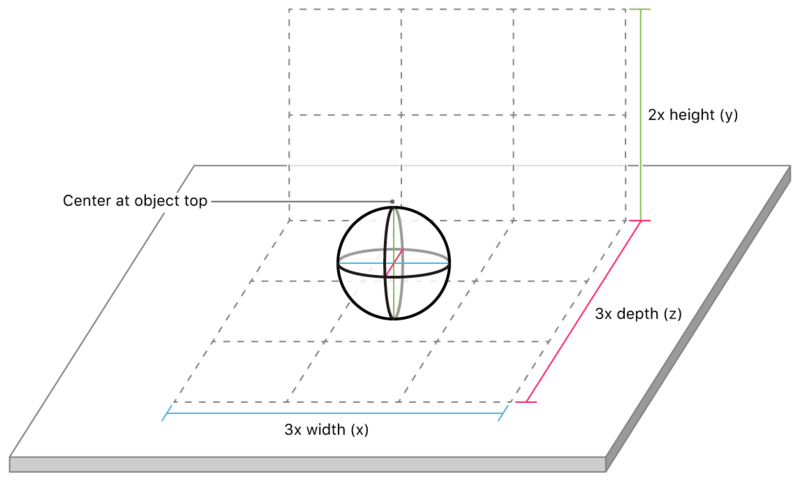 The probe’s position should be at the top center of the virtual object, and the y component of its extent should be twice the height of the object. This ensures that the bottom of the probe extent aligns with the bottom of the virtual object, accurately capturing the real surface the object sits on. The x and z components of the probe’s extent should be three times the width and depth of the object, ensuring that the probe captures the area beneath and around the object. Avoid virtual content that requires accurate reflections, such as mirror-finish surfaces. In general, an AR experience doesn’t have all the information needed to produce a perfect imitation of reality. Good AR experiences carefully design content to hide limitations in realism, preserving the illusion that virtual objects inhabit the user’s real-world surroundings. ARKit environment textures don’t image the environment in all directions around the user, and don’t update in real time, so some kinds of content aren’t well suited for use in AR. For example, a user encountering a virtual mirror may expect to see their own reflection. Design virtual content to use fully-reflective surfaces only in small or highly-detailed parts, and use less reflectivity in large flat surfaces. If the path of an object’s movement is known ahead of time, create multiple environment probe anchors and place them along that path. Create a global environment probe with an extra-large extent to fall back to when rendering objects that have moved outside the extent of nearby probes. After an object moves, create a new probe to capture the area around its new position, and remove environment probes associated with earlier positions. When you display AR content with ARSCNView, SceneKit automatically interpolates between environment textures for any objects that overlap the extents of multiple environment probes. Don’t generate environment textures too often. ARKit requires some time to collect camera imagery, and combining and extrapolating that imagery to produce environment textures requires computational resources. Frequently adding new AREnvironmentProbeAnchor instances to your AR session may not produce noticeable changes in the displayed scene, but does cost battery power and reduce the performance overhead available for other aspects of your AR experience. Avoid abrupt transitions between different environment textures. With ARSCNView, if the environment probe texture(s) affecting an object change (either because the object moves or because a new texture becomes available for its current position), SceneKit automatically uses a short fade-in animation to transition to the new result. Depending on what environment textures are in use before and after the transition, that change may be jarring to the user. To avoid unrealistic transitions, this sample app waits until the first environment texture becomes available before allowing the user to place virtual content. In automatic mode, as soon as the session begins, ARKit automatically begins generating a fallback environment texture covering a large area. In manual mode, the app creates its own fallback environment probe. (See the sample updateSceneEnvironmentProbe(for:) function.) Waiting until this environment texture is available ensures that virtual objects always reflect an environment appropriate to the session. Alternatively, your app may include a static environment-map texture for use as a fallback when environment texturing is not available (for example, to support earlier iOS versions). In this case, try to design or select a texture that appears realistic in a wide variety of situations.